March 25, 2014. China does not accept Malaysia’s claim that MH370 crashed in Indian Ocean. Further evidences are requested to provide a solid proof that the plane really crashed on a remote location near West Perth. It was confirmed by Malaysia Prime Minister Najib Razak that the jet crashed and there’s no hope that anyone survived last March 24. 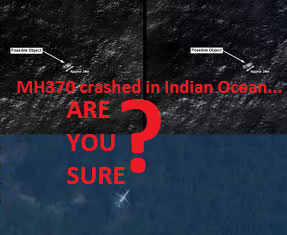 Several questions now rise: How sure is Malaysia declaring that the MH370 really crashed in Indian Ocean? On the statement of PM Razak, he said that it was based on the latest data, nothing more. What is that latest data? How sure is the statement? The countries around the world have united for possible search and rescue operation for the said plane. In fact, there are so many theories and doubts regarding the plane’s mysterious vanishing that have puzzled the minds of so many people around the world. Some said that the plain might be hijacked. Some said that it might have crashed somewhere as what this news is saying. And weird, some said that there might be an extraterrestrial interference. Whatever will be the cause of this phenomenon, we have to look forward for more news. This news update was based on TV5 news. It’s more than two weeks already since the vanishing of MH370 and hearing that the plane crashed in Indian Ocean causes emotional turmoil in the families of the passengers of the said aircraft. The missing jet is a proof that the world is truly big enough for a plane we consider “big”. In fact, it is considered as one of the safest planes in the world. You must be thinking right now. And have questions in your minds. What if the news is true? How can the families of the passengers of the said plane cope up with this situation? Be updated on latest news about missing MH370 here.